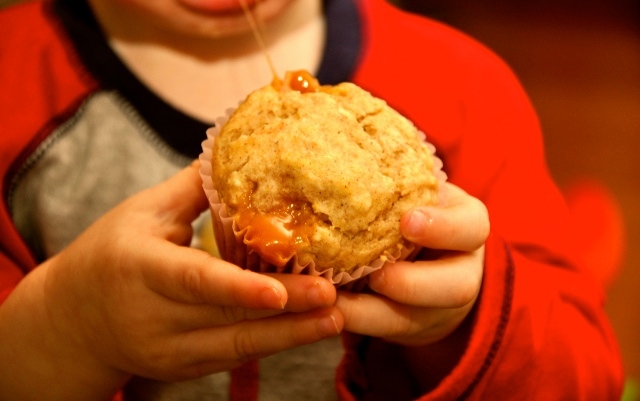 These muffins are great not only for Halloween but also for using fruit in a dessert. 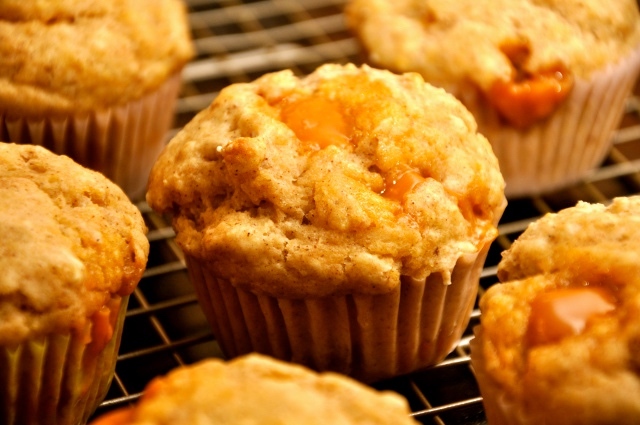 The warm caramel is gooey and, combined with cinnamon and apples, delicious. 1. Preheat oven to 350 degrees. Grease muffin pan with cooking spray or line with paper liners. 2. In a large bowl, combine flour, sugar, cinnamon, baking powder, and salt. 3. In another bowl, combine egg and milk. Stir in butter and vanilla extract. 4. Add flour mixture to wet mixture and stir just to blend. 5. Stir in applesauce and caramels. 7. Bake for 25 minutes or until tops spring back when lightly pressed. Serve warm. Thanks Arielle! I’ll tell my boys you said so 🙂 Your site is beautiful (and not just the food-related content! ).